In the mid 1830’s, Thomas Knighton led a group of 600 Primitive Methodists to establish a new independent religion which they called United Brethren. Amongst the three counties there were 50 designated preachers for the scattered congregation. In 1836 the United Brethren built Gadfield Elm Chapel, near Pendock, approximately a 15 minute drive from Ledbury. In 1840 Wilford Woodruff a Latter Day Saint missionary was invited to the area by William Benbow, he then met William’s brother John and sister in law Jane. John and Jane lived near Castle Frome at Hill Farm, within a few days Elder Woodruff had baptised 6 people in the pond at Hill Farm. Meetings continued to be held at Hill Farm with Wilford Woodruff preaching. religion and sent the parish churchwarden and clerk to find out more for him. However Wilford Woodruff converted them both and a local policeman who was sent to arrest him. Within a month Woodruff had baptised 600 people into the Mormon faith. All but one of the United Brethren United Brethren became a Latter Day Saint and by January 1841 a total of 1800 people had be baptised. The United Brethren’s donated 45 houses and the Gadfield Elm Chapel. However to finance a trip to America for the converts to migrate, Gardfield Elm was sold and used as a storage for farm implements. The building was derelict for many years until 1994 when it was put up for auction. Local Bishop Wayne Gardener raised £7000 to win the bid and pay for urgent repairs. The chapel is now open for people of all faiths and is a place of peace and tranquillity. Mainly serving as a museum and visitors centre, it is the oldest Mormon chapel in the world. Hill Farm Pond is still visited by hundreds of Mormons every year with occasional baptisims taking place there. The chapel is usually staffed on the following days : Wednesdays from 11 a.m. till 3 p.m. Fridays and Saturdays from 11 a.m. till 5 p.m. Sundays from 2 p.m. till 5 p.m. To arrange a visit outside these times please telephone 01452 840576. 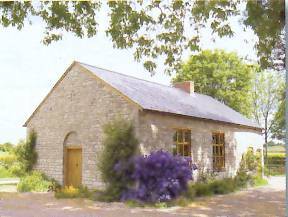 The chapel does not have a mains water supply and the toilet facilities are very limited. Car parking and entrance is free. View other Historical and Tourism Articles in Ledbury.